Australian Rainbows was officially opened on the 24th July 2014 during a private event by the mayor of Colchester. The mayor, mayoress and a number of guests were then invited to take a tour of the tropical walkthrough and its facilities before getting the chance to feed these colourful birds a treat of nectar. Work to transform the Wild About Animals Theatre into the aviary began in January 2014. The theatre stage and seating were removed and the roof replaced to give the correct ‘tropical rainforest’ atmosphere. Inside, the rock work for the waterfall and large pond were added, complete with water for the rainbow fish which also inhabit the enclosure. 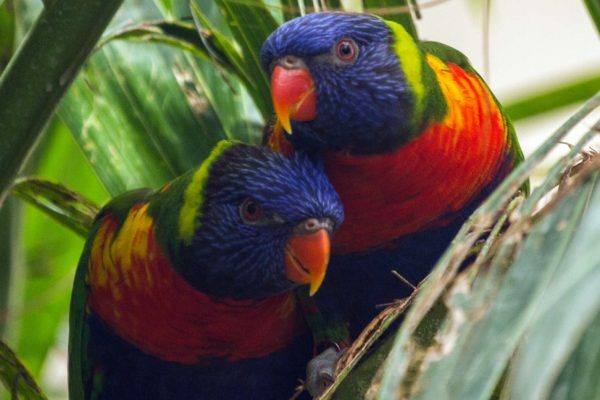 The installation of the colourful gardens and green walls completed the project so visitors are able to journey through this exotic aviary of lorikeets, with the chance to get up close with these birds whilst feeding them a pot of golden nectar*. Since its completion the aviary has become an exciting, interactive addition to Colchester Zoo which visitors of all ages enjoy. We are pleased to provide this interactive exhibit for visitors. In order for it to be enjoyed safely there a few do’s and don’ts that must be considered. Touch or grab the birds. NB: Open daily from 10.30am, check closing times on day of visit. Feeding times may vary as the lorikeets are given a quota of nectar each day therefore we cannot guarantee times of when they will be feeding. A small charge applies if you wish to feed the birds.